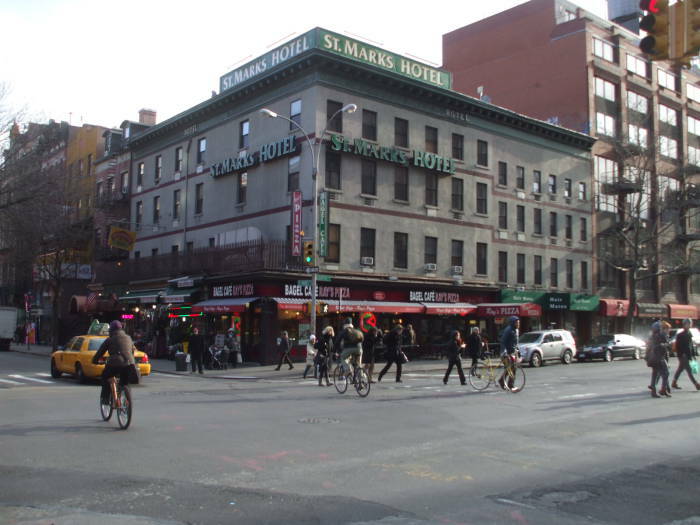 We are on East 8th Street approaching its intersection with Third Avenue — beyond this its name changes to Saint Marks Place. The main building of the Cooper Union for the Advancement of Science and Art is across 8th Street to our right, and the corner of that building is visible in the first picture. 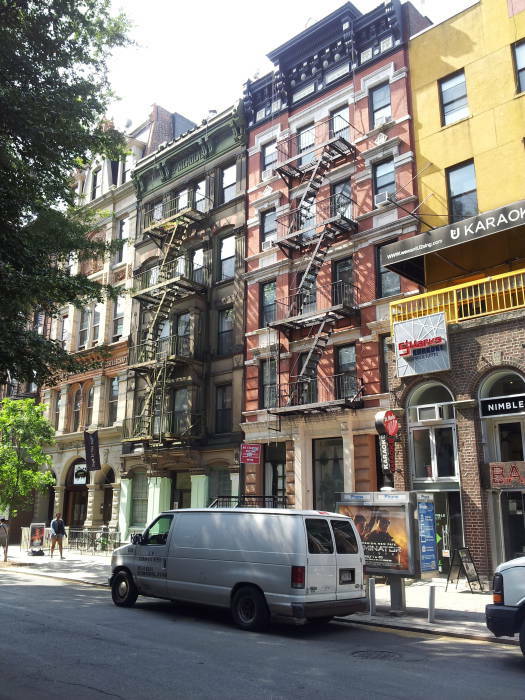 This street started as West 8th Street at its intersection with Sixth Avenue, also called the Avenue of the Americas, then changed from West to East at Fifth Avenue. The building on the corner was originally the Valencia Hotel, and the Five-Spot jazz club was established on its ground floor in 1962. 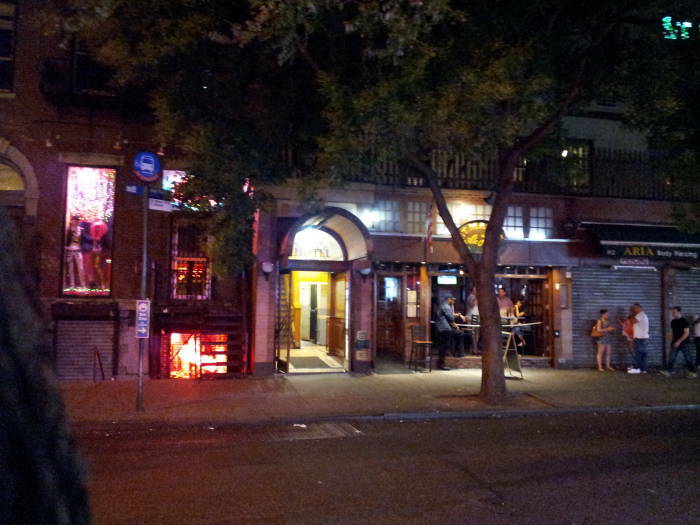 It was one of New York's leading jazz venues in the 1960s. 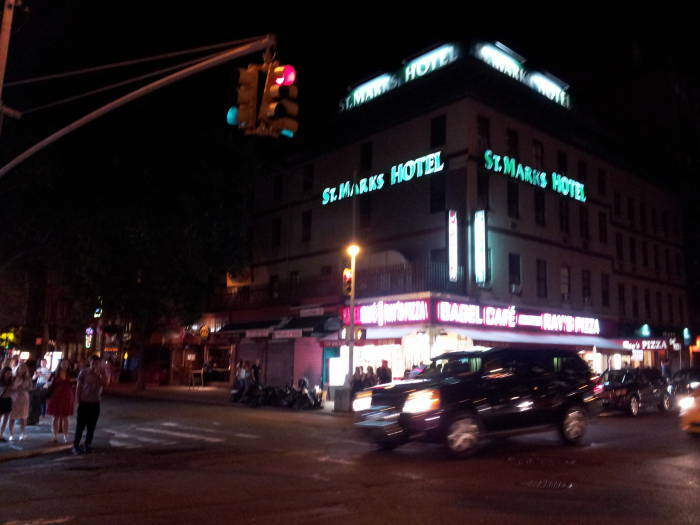 Charlie Parker, Thelonius Monk, Charles Mingus, and other major jazz figures performed here. 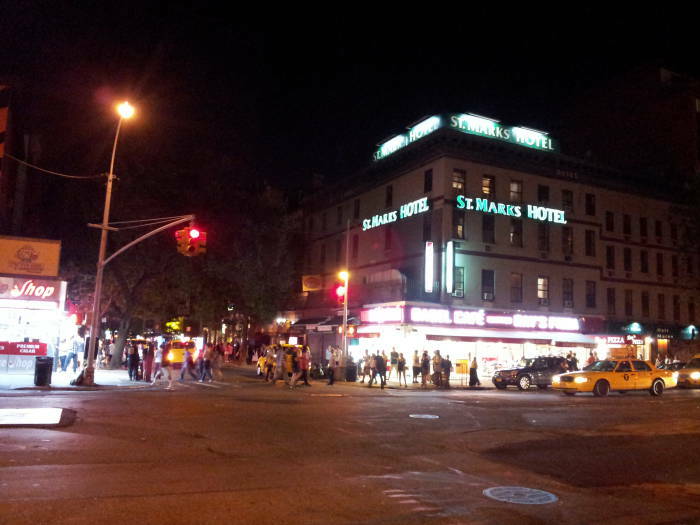 The St Marks Hotel occupies the upper floors, the rest of the ground floor is now occupied by the Bagel Café and Ray's Pizza, some small open-front shops, and the St Marks Ale House. The first two pictures below were taken in late afternoon in winter. 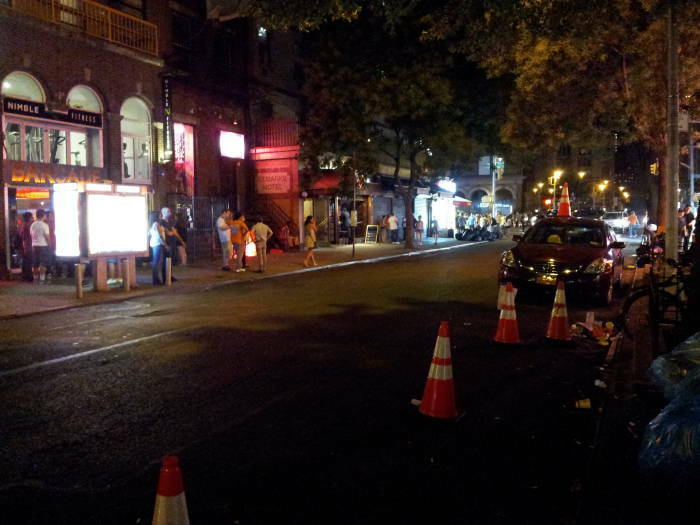 The corner of Cooper Union is on the right of the first picture. 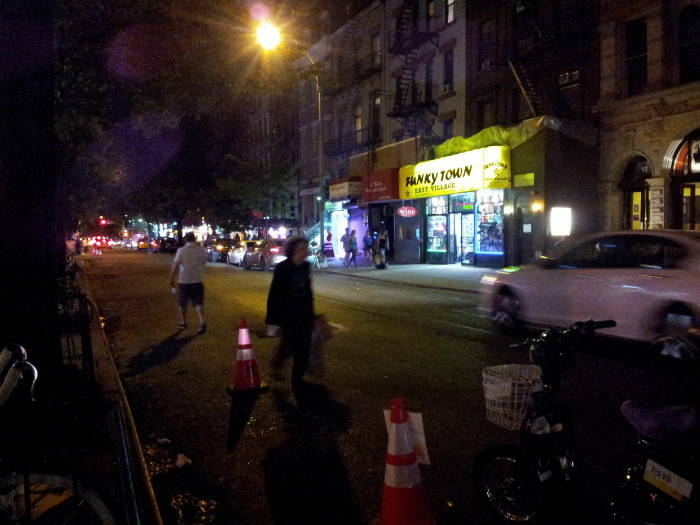 Here is the same intersection close to midnight in July. 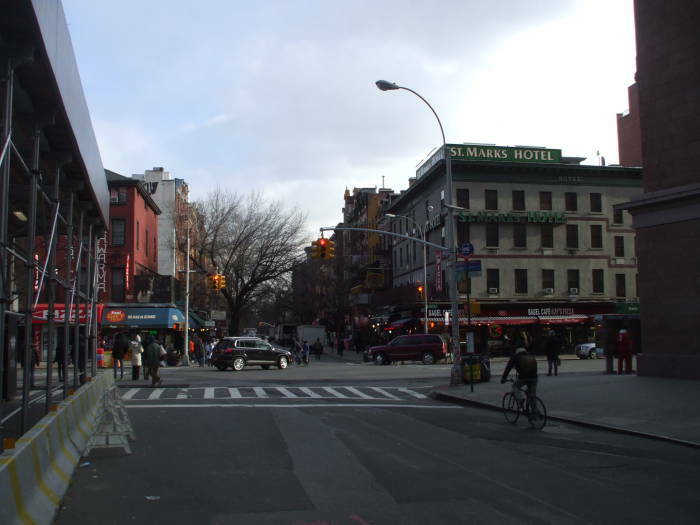 We will cross to the northeast corner of Third Avenue and St Marks Place and then turn and look back at Cooper Union. Many of the pictures on the pages showing the south sides of the street were taken in the morning when the light was better but many businesses were closed. Below are some pictures taken in early afternoon and close to midnight. The Hamilton-Holly House at #4, the red brick structure with the round arch over a pair of grey plain metal doors, was built in 1831. Colonel Alexander Hamilton, the son of the Alexander Hamilton who was the first U.S. Secretary of the Treasury, owned it from 1833 through 1843. The author James Fenimore Cooper lived here from 1834 through 1836. 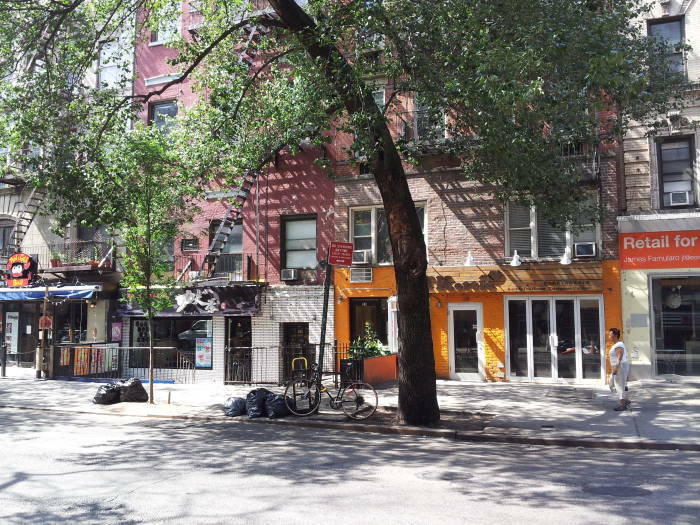 The now largely yellow building to the left or east is #6 St. Marks Place. 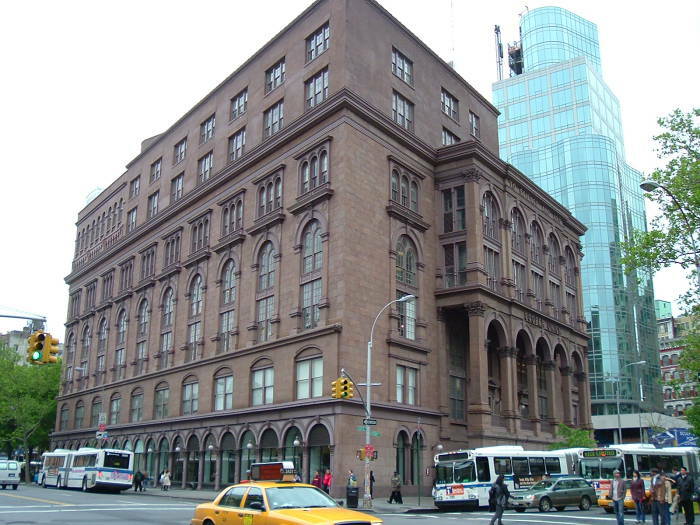 It was the site of the New York branch of The Modern School. The Modern School was founded by Francesco Ferrer i Guàrdia in Barcelona in 1901 to teach radical social values to middle-class children. Ferrer was executed in 1909 for plotting to kill Alfonso XIII, the King of Spain, and for being the mastermind behind Tragic Week, a mass riot in and around Barcelona. The anarchists Emma Goldman and Alexander Berkman then founded the Francisco Ferrer Association in 1910 "to perpetuate the work and memory of Francisco Ferrer" and then opened a branch of The New School here in 1911. The artist Man Ray was a student when the school first opened. The faculty included the philosopher Will Durant, the artist George Bellows, and the writers Jack London and Upton Sinclair. That only lasted in this location until 1913, when the anarchists became occupied with planning dynamite bombings and other attacks. The Saint Marks Russian and Turkish Baths took over the space, it was simply a traditional Russian and Turkish style bath. 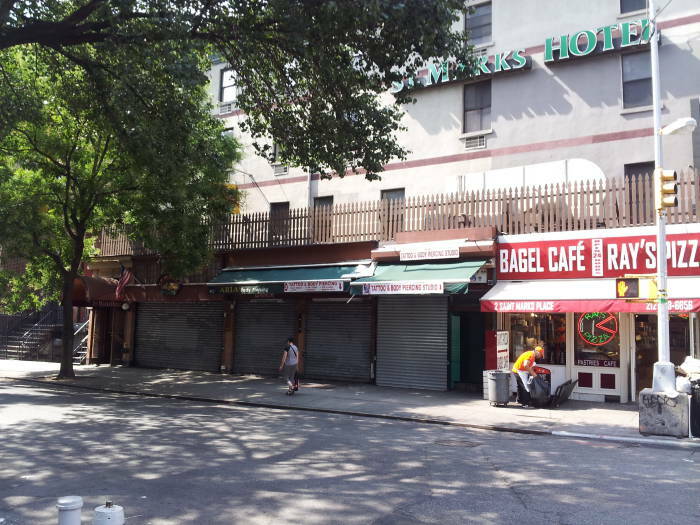 That was renovated in 1979 and reopened as the New Saint Marks Baths, a gay bath house, which was closed by the New York City Department of Health in 1985 due to concerns over IHV transmission. The red brick building to its left or east is #8. 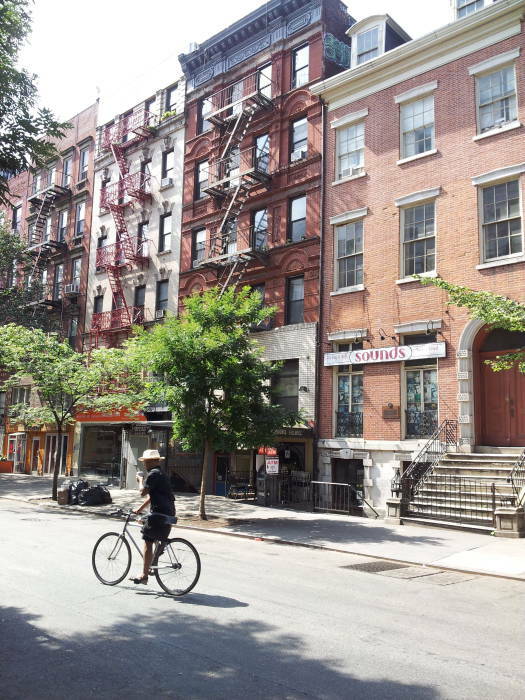 The New York Cooking School was founded here in 1876 by Juliet Corson. It was the country's first cooking school. 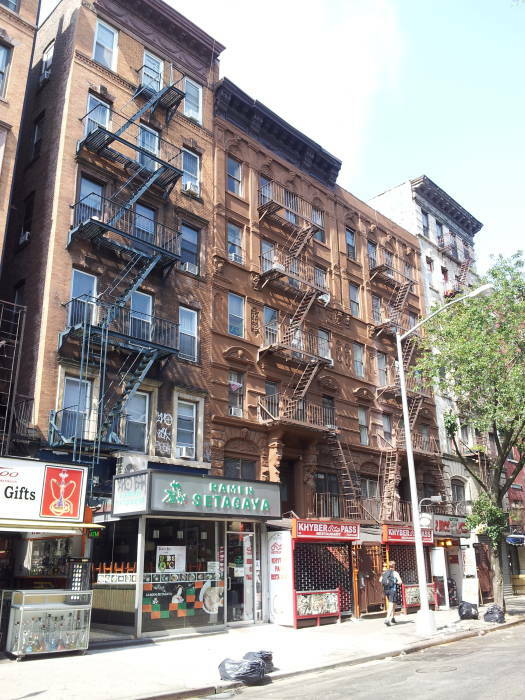 By 1888 it was the home of La Triniria Italian Restaurant and connected to the first known Mafia hit in Manhattan. 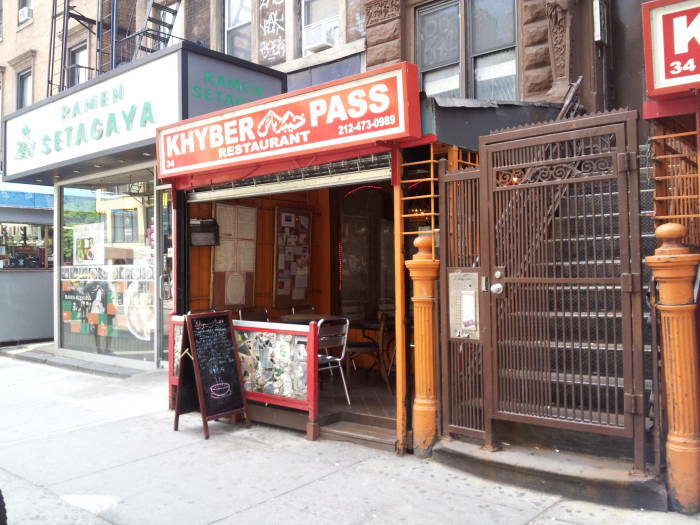 Carlo Quarteraro dined here with victim Antonio Flaccomio and then stabbed him to death nearby, on the southwest corner of 8th Street and Third Avenue, by Cooper Union. Yes, these are Buddhist monks, the Dalai Lama was in the city in July 2015 when this picture was taken. I've been able to see the Dalai Lama speak twice, once in Central Park in New York in August 1999, and the second time in Washington DC in July 2011. This week I was in the same city but working through the week while he spoke on Thursday and Friday afternoons. 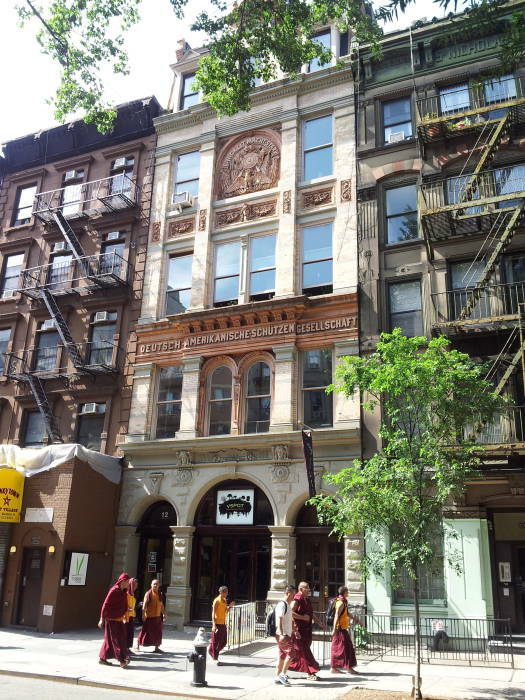 The Buddhist monks are walking past #12 St. Marks, built in 1885 as the clubhouse and headquarters for the Deutsch-Amerikanische Schuetzen Gesellschaft or the German-American Shooting Society. Near the top of the façade is their motto, Einigkeit macht stark or Unity is strength. This area of Manhattan was Kleindeutschland or "Little Germany" from the mid 1800s until June 15, 1904, when the SS General Slocum excursion steamer caught fire in the East River with about 1,350 German immigrants aboard. 1,021 died. Many of the survivors in Kleindeutschland moved away, returning to Germany or establishing a new Germantown on the Upper East Side. Poles and Russians moved in to take their place, and today Ukrainians are the dominant nationality. 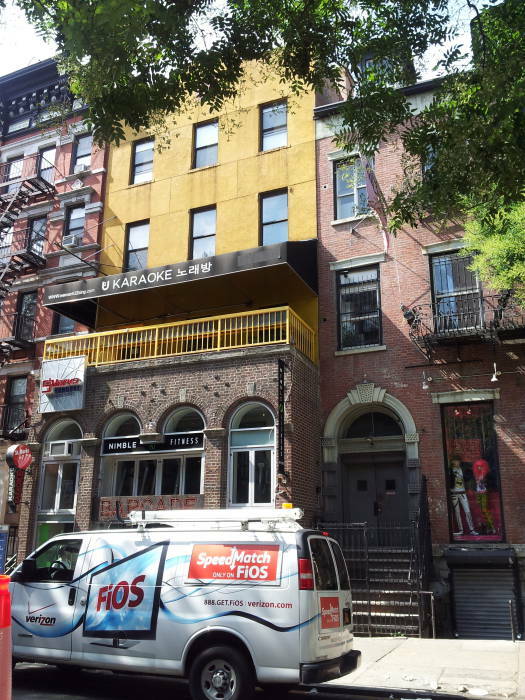 The Daniel Leroy House at #20 St. Marks Place is the relatively plain building with the smooth brick façade and dormer windows sticking out of the roof, visible in the last picture above and the first one below. This mansion was once part of the row that lined the entire block. With its arched Federal-Baroque doorway, grand proportions and original wrought iron handrails at the stoop, it is now a rare survivor of a type which, because of its great cost, was never common. The row, one of the few ever built in this style in New York, was constructed in 1832 by Thomas E. Davis, a speculative builder. No. 20 was purchased by Daniel Leroy, brother-in-law of Hamilton Fish and son-in-law of Nicholas Fish, whose nearby home at No. 21 Stuyvesant Street is also a landmark. 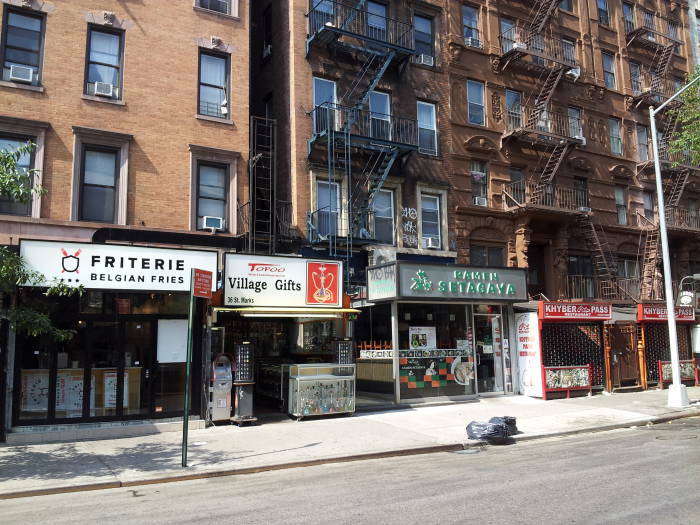 #28 St. Marks Place, with the white brick first floor just to the left or east of the bright orange brick, housed Underground Uplift Unlimited or UUU from 1967 to 1971. 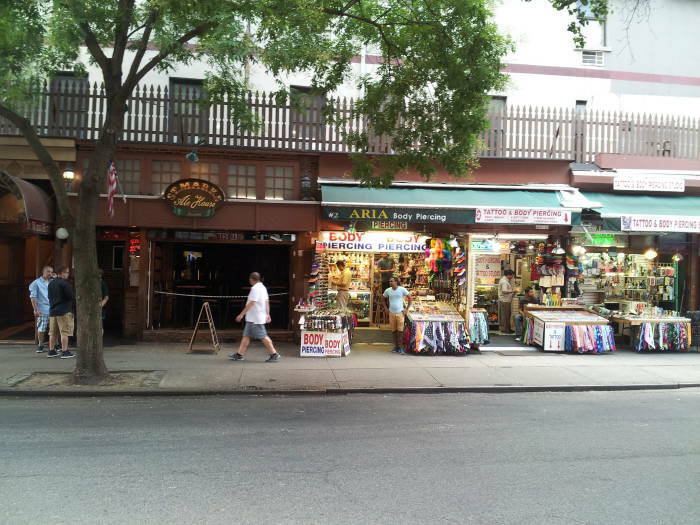 This is where the original "Make Love Not War" protest buttons and posters were created and sold. 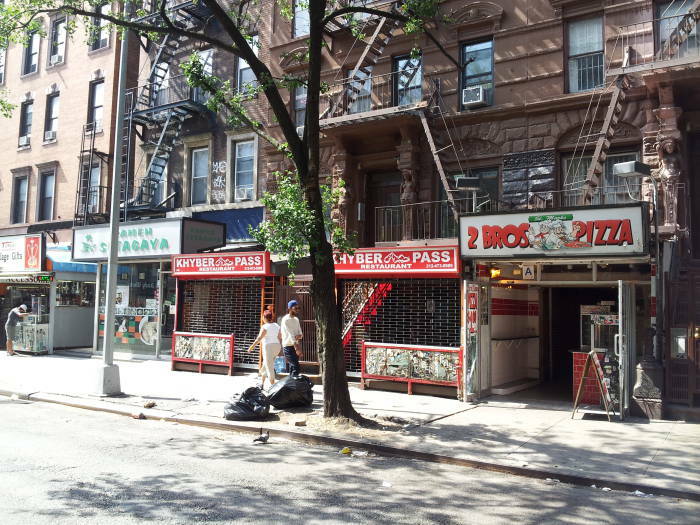 #30 St. Marks Place is now occupied by the Red and Gold Boil Cajun/Creole restaurant. But in 1967–1968 Abbie and Anita Hoffman lived here in a basement apartment where they and Jerry Rubin co-founded the Yippies. 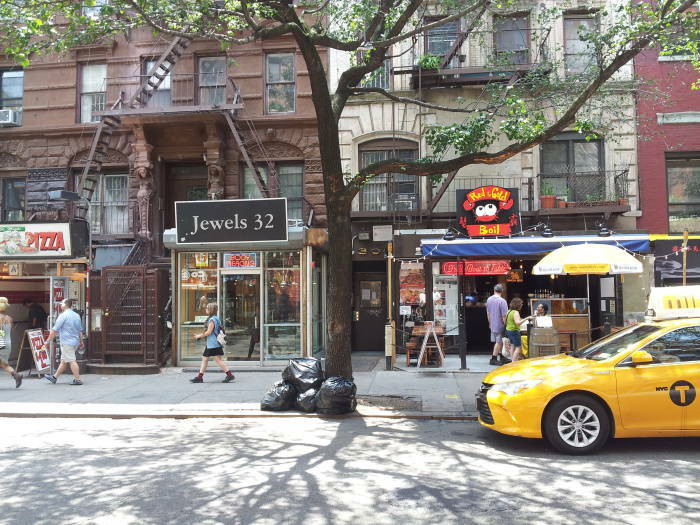 #32 was home to the band Deee-Lite in the 1980s, now it's a jewelry shop. That's largely the story of this area. A band that collaborated with Bootsy Collins was once based here. 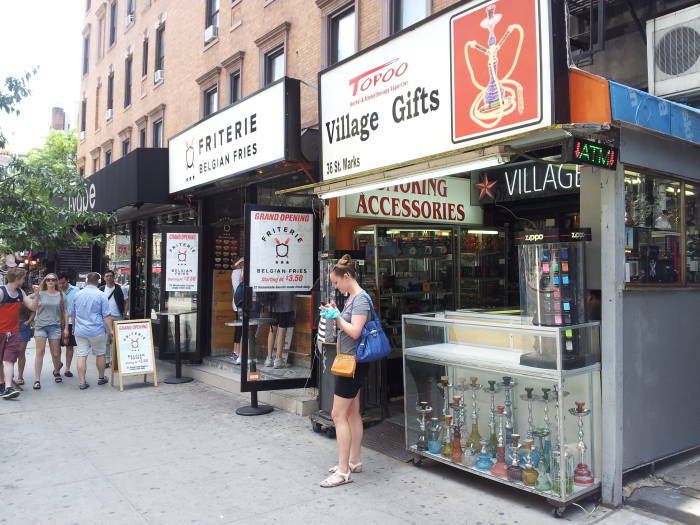 This year it's a largely indistinguishable jewelry shop and next year it may be a kebab shop or a late-night ramen place or yet another tattoo-and-piercing parlor. 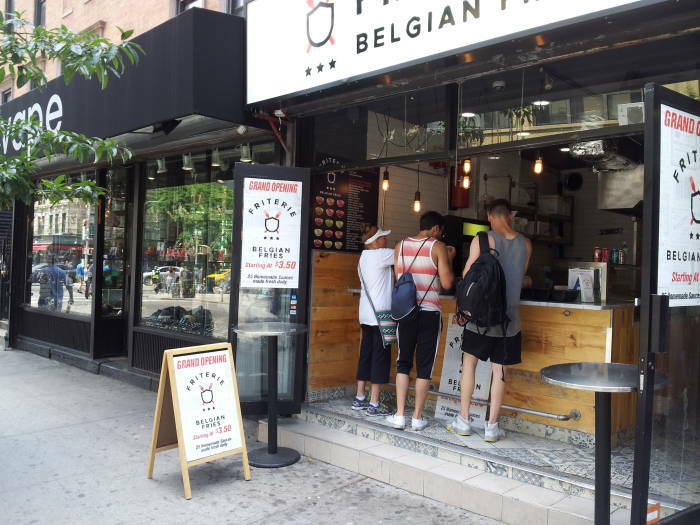 Belgium has established several beachheads in New York. This is one of several Belgian friteries in the city. 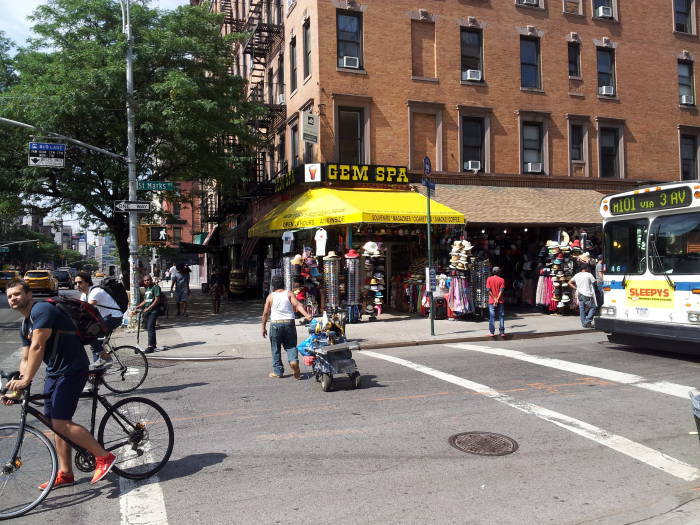 Gem Spa opened under another name in the 1920s, and has been a prominent newsstand ever since, now receiving magazines one or two days before other newsstands in the city. 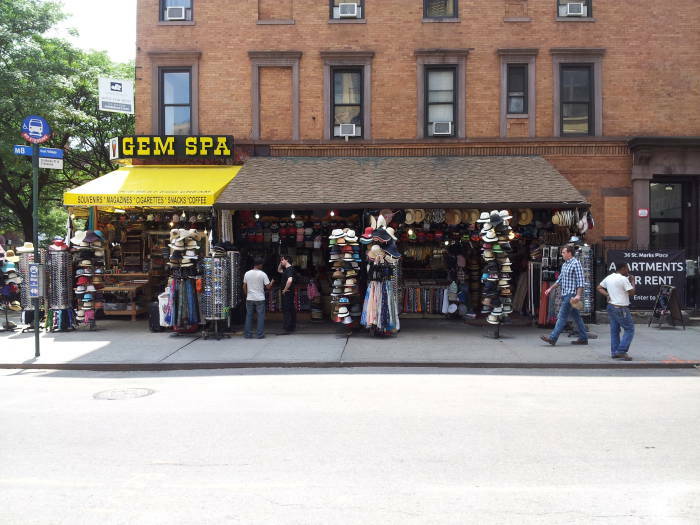 It was renamed "Gem Spa" in 1957, when it was a gathering place for the Beats. It has been open 24 hours a day for decades, outside a period from February to June in 1972 when it was closed due to financial problems and a fire. Its initial focus was Jewish and foreign-language papers, shifting to underground publications around 1963 as the Beats were replaced with the hippies. 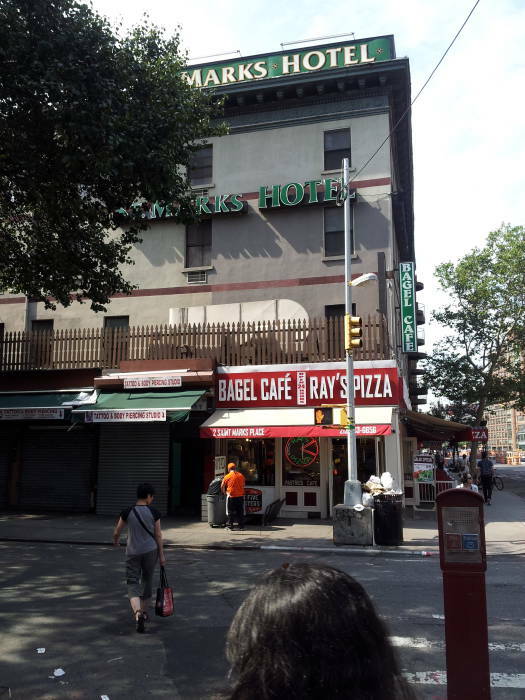 It is known as the birthplace of the "authentic New-York-City-style egg cream", a beverage containing milk and soda water plus either vanilla or chocolate syrup, and uncontaminated by either eggs or cream. 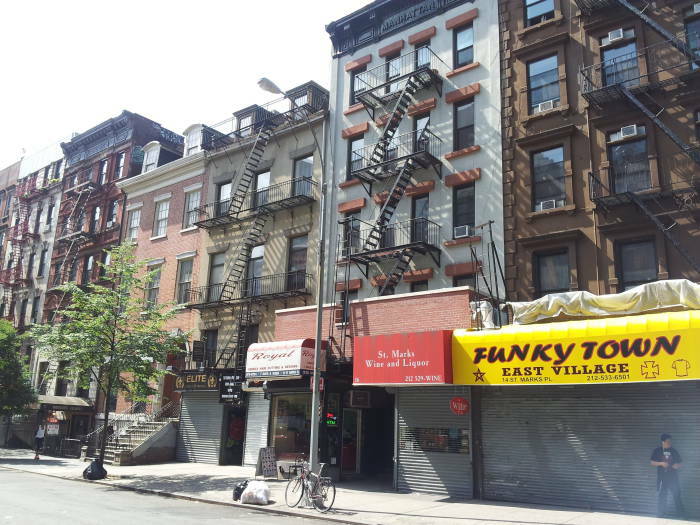 If you continue south on Second Avenue along its west side almost to 6th Street, you come to the former Fillmore East theater where many of the most popular musical acts performed between 1968 and 1971. 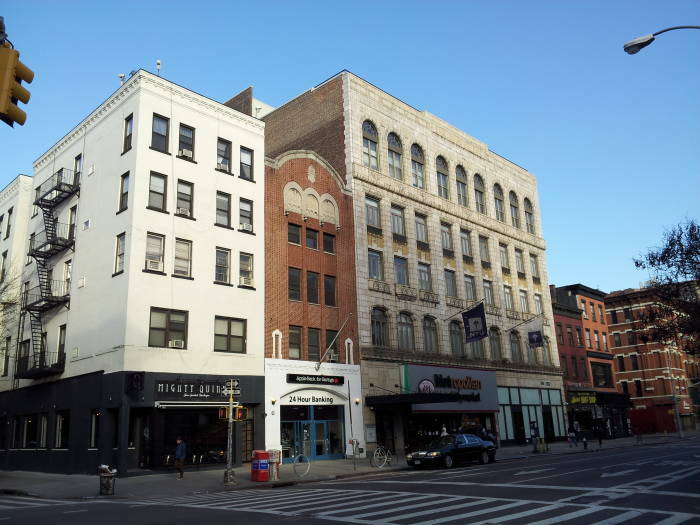 The brick building with arches was built as a Yiddish theater in 1925-1926. It has a narrow façade but had a capacity of almost 2,700 people. It was taken over by Loews Inc. and became a movie theater. By 1967 it had fallen into disrepair. Bill Graham opened it on 8 March 1968, and ran multiple shows per night, several nights per week. The Grateful Dead played 43 concerts there, and the Allman Brothers band played so many shows that htey came to be called "Bill Graham's House Band." Those bands recorded live albums here, as did the Crosby Stills, Nash and Young, Miles Davis, Derek and the Dominos, Jimi Hendrix, Jefferson Airplane, Neil Young and Crazy Horse, Frank Zappa, and several others. Now the interior has been demolished and rebuilt. It's a bank at street level and apartments above.